The HydraLight can be switched on and off like a regular flashlight, and can run up to 100 continuous hours on a single water charge. With a rubberized armor coating, the HydraLight is rugged, durable, and made to last. It can safely be used in even the worst weather conditions. With a handheld light, you need one hand to hold the light…but with the HydraLight, you now have both hands-free! It’s perfect for outdoor camping activities. It can even hang inside your tent. It’s perfect for your boat, or for anytime you need a hands-free light. The HydraLight is the perfect long-lasting light for emergencies of all kinds. Be sure and read Kristin's full review here! 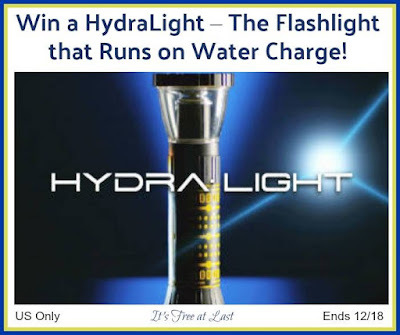 Hydralight Flashlight that Runs on Water! Giveaway ends 12/18/17 at 11:59 pm ET! Open to US residents 18+ and older. Yes always on days when the electricity goes out. I have been without a flashlight and it was not fun. We always have either no batteries or dead batteries in our flashlights because the kids like to play with them. I can't remember any specific time that I've been without, but probably did before flashlights were on phones. Thank you for the chance to win! Constantly! I am always looking for the perfect flashlight that will not fail me...and I still haven't found it...maybe this one? kate g.
Yes I have or the flashlight I have always seems to have dead batteries and it seems I have to see my way to my car in the dark while stepping in mud puddles. Yes. And finding your batteries are old and your light dim or out is the pits.